Right off the top of your head, can you name a sport, an ice cream flavor, and something in a pet shop, all beginning with the letter B? The trick is to take on 12 categories in 3 minures or less and not match anyone else's answers! So be creative and seek the unique before the timer runs out. With more than 190 categoriees and 20 letters on the die, no game is ever the same. 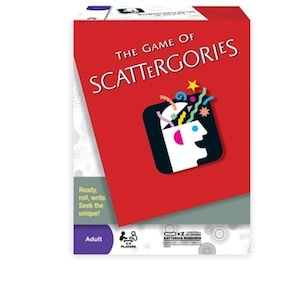 For crowd-pleasing, fast-thinking fun, the choice is Scattergories! Includes 48 category cards, 6 folders, 6 plastic clip strips, answer pad, 6 pencils, 20-sided die, timer, die-rolling board and rules. Require 2 AAA (not included). For 2-6 players. Ages 12 and up.